Matthew Orlovich works as a freelance composer, based in Sydney, Australia. Born in 1970, Orlovich studied composition at the University of Sydney with Eric Gross and Peter Sculthorpe, gaining a BMus (Hons) and the University of Sydney Medal in 1993, and a PhD in 2000. His catalogue of works includes music for solo instrumentalists, chamber ensembles, choirs, orchestras, concert bands and combined choirs with orchestra. His music has been performed extensively throughout Europe, as well as in Canada, the Middle East, USA, Australia and New Zealand. Performers have included the Australian Intervarsity Choral Festival Choir, Gondwana Voices, RompDuo, the Melbourne Chorale, Anhinga pianoSAX Duo, St Peters Chorale, Zurich Ensemble for New Music, the Choir of London, The Australian Voices, the Hunter Singers, the Grevillea Ensemble with guest artist Diana Doherty, the Harvard University Choir, the United States Navy Band, The Song Company, Waratah Girls Choir, the Sydney and Tasmanian Symphony Orchestras, and many more. Since the early 1990s, Matthew Orlovich's music has gained increasing recognition. He was awarded the Jean Bogan Memorial Prize in 1994 and the ABC Orchestral Composers' Award in 1995. In 1996 two of his choral scores, On Sutherland's Grave and The Listening Land, were performed at the 4th World Symposium on Choral Music, and in 1997 his commissions included Lo, there is light! for the 87th Harvard University Carol Service, and Unity and The Dreaming Land for massed school choirs and orchestra, presented by the NSW Performing Arts Unit. Since 2000, Orlovich has completed numerous commissioned works. Eternity, composed for the massed voices of 19 Sydney college choirs, with orchestra and organ, was written for the Millennium Concert, with special regard to the resounding acoustic of St Mary's Cathedral, Sydney, where it received its premiere in July 2000. Other commissioned works include Araluen (written for the 2001 St Peter's Chorale international tour), A dream only just begun (for choir, orchestra and soloist, commissioned by Ars Musica Australis to commemorate Australia's Centenary of Federation), Waratah (composed for Sydney Philharmonia Choirs and Ensemble), Huge Earth (for St Andrew's Cathedral School's massed SATB and SA choirs, motet choir, orchestra and pipe organ), Ezekiel (for the Hunter Singers Canadian Tour), She Like the Moon Arises (for the Grevillea Ensemble featuring guest artist Diana Doherty), Night (for choir, didgeridoo, clap sticks and handbells, premiered at the 2006 International Handbell Symposium, Brisbane), White Horses (commissioned by Reed Music for symphonic wind ensemble) and two Australian Christmas Carols (commissioned by Oriana Chorale for premiere performance at the National Museum of Australia, ACT). Latest commissions include a choral work for performance by "Blokes of Barker" at the 2011 Pemulwuy National Male Voice Festival, a concerto for performance by the United States Navy Band with saxophone soloist Barry Cockcroft at the 34th International Saxophone Symposium, USA, a cappella choral scores for The Australian Voices (QLD), In Harmony Choir (NSW) and 60th Australian Intervarsity Choral Festival (TAS), plus new concert band works for Reed Music (VIC) and last but not least, a "101 Commissions" work for performance by the Sydney Conservatorium Chamber Choir, directed by Dr Neil McEwan (NSW). Matthew Orlovich is a full writer/member of APRA. 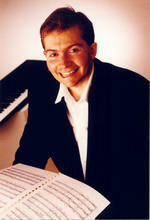 He is in demand as a visiting composer at numerous Sydney high schools and colleges. When not composing music, he may be found swimming laps at the beach, reading books, cycling, playing the piano and exploring his hobbies of clay sculpture and painting. Additional details about Matthew's latest commissions is available on his website and blog. Butterflies dance : SATB choir (2009) Commissioned by The Australian Voices. Nativity : for a cappella SATB choir (2008) Commissioned by Oriana Chorale.